Since its launch in December 2016, the American Talent Initiative (ATI), a Bloomberg Philanthropies effort led by the Aspen Institute’s College Excellence Program and Ithaka S+R, has grown from 30 to 86 member institutions. With a mission to enroll 50,000 more talented low-and moderate-income students at higher education institutions with strong graduation rates by 2025, ATI shared last week that six member schools have already developed detailed action plans to attract, enroll and support high-achieving, lower-income students. Yale University, Wake Forest University, the University of Texas at Austin, University of Washington, Georgia Institute of Technology and Elizabethtown College are the first six ATI schools that have made public commitments to support low- and moderate-income students in all facets “before they arrive on campus to graduation and beyond,” ATI officials said in a statement. A number of strategies outlined in several schools’ action plans aim to improve socioeconomic diversity at these top institutions by identifying and recruiting talented, high-achieving high school graduates and transfer students from community colleges. Some schools will reach out directly to the “neediest families” to increase the number of applications received and the enrollment of Pell-eligible and first-generation students. 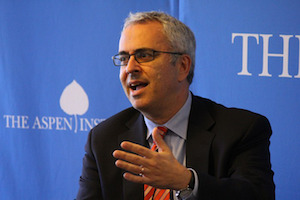 Joshua Wyner, founder and executive director of Aspen Institute’s College Excellence Program, said that the “50,000 additional students” goal builds on the research of Dr. Caroline M. Hoxby, who found that a vast majority of very high-achieving students who are low-income do not apply to any selective higher education institutions. ATI’s efforts start from the premise that there is an “immense” amount of talent in communities across the country. ATI’s member institutions seek to change this with six ATI schools taking the reins on tapping into diverse communities full of student potential. At Wake Forest, for example, officials have committed to increase applications from Pell-eligible students by 50 percent and to increase the share of Pell recipients enrolled by more than 40 percent. They’ve also pledged to increase the share of students who receive need-based aid by 25 percent and to increase the mean graduation rate for Pell recipients by 12.5 percent. UT Austin have committed to increase the four-year graduation rate from 52 percent to 70 percent in five years. Georgia Tech committed to increase the amount of need-based aid given by 30 percent. The University of Washington plans to graduate an additional 125 low- and middle income students per cohort by 2025. And Elizabethtown College has committed to increase the number of transfer students from 25 in 2017 to 100 annually by 2021, a 400 percent increase. Dr. Peter Salovey, president of Yale, said that he was delighted that Yale is participating in the American Talent Initiative’s movement to help increase the number of talented first-generation and low-income students at top schools. As part of the ATI effort, Yale has committed to enrolling 225 more Pell grant students in addition to enrolling 150 more first-generation students. In the last five years, the school increased the number of undergraduate first-generation students in the entering class by 62 percent, and also increased the number of incoming students receiving Pell grants by 61 percent. ATI says that more than 85 percent of its member institutions that have joined within the last year have drafted comparable student support plans, while newer members are planning to propose plans in the next few months. A school must initially have a graduation rate of 70 percent or better for three of the past five years to become eligible to be an ATI member institution. Beyond this requirement, a school’s president must express an interest, speak with Wyner or other members of ATI’s hearing committee and then sign a letter of participation detailing a set agreement. Once the school is a member institution, the school must submit baseline data annually on the number of Pell students that are enrolled and the number of Pell students that graduate. The school must also sign a “collective impact framework” that sets the goals for how they will contribute to ATI’s “50,000 additional students” goal by 2025. Member institutions will work alongside ATI to collectively achieve their mission: the organization will help schools develop strategic plans for economically diverse student recruitment and ensure that these students engage in campus life. The partnerships between ATI and the schools will also look to prioritize need-based financial aid to make attendance affordable, and close inequity gaps in matriculation and graduation rates between students of different socioeconomic status, the organization said. As ATI’s member institutions proactively work to support lower income students, they expect to raise the number of students at top schools from approximately 480,000 to 530,000 students in the next eight years. A reality for some lower-income students on campus, Wyner adds, is that they may struggle to get home for the holidays, struggle to find adequate clothing for internships or struggle to understand the importance of reaching out to professors for research opportunities.